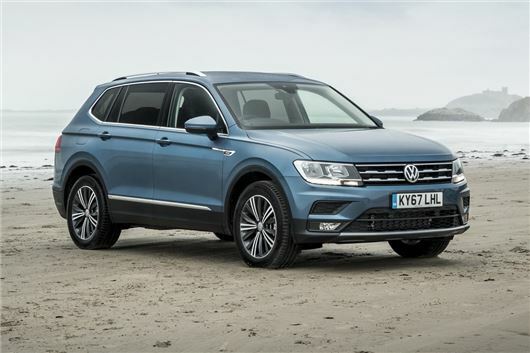 The new seven-seat Volkswagen Tiguan Allspace is now available to order from dealers with prices starting at £29,370. To accomodate a third row of seats, the Allspace has a longer wheelbase than the standard Tiguan and is 215mm longer - making it pretty much identical in length to the Skoda Kodiaq. Like the Kodiaq, the middle row of seats can slide forward and back while all the rear seats can be folded down flat. Standard boot space is 700 litres - put the third row up and there's still a useable 230 litres. The engine range echoes the standard Tiguan with the entry-level models powered by the 1.4 TSI engine with 150PS and having front-wheel drive. There's also a 2.0 TSI 180 with 4Motion and a DSG gearbox. The 2.0 TDI engine is available in three different versions, 150PS, 190PS and the top of the range 240PS version. Official fuel economy ranges from 46.3mpg for the 150 PS TSI to 43.5mpg in the 240PS TDI diesel engine. There are three trim levels - SE Navigation, SEL and R-Line and all models have parking sensors, 3Zone climate control, Discover Navigation with an 8.0-inch colour touchscreen, satellite navigation, adaptive cruise control DAB radio and a CD player, as well as Bluetooth. SEL models add Active Info Display with 12.3-inch TFT screen in place of the traditional instrument dials, 19-inch alloy wheels, front sports seats with 14-way adjustment, hands-free boot opening and a panoramic sunroof. The R-Line gets 20-inch Suzuka alloy wheels, sports suspension that's lowered by 15 mm, a body-coloured rear spoiler and black interior rooflining. There is an optional off-road pack which comes with an different front bumper design to increase the approach angle from 16.9 degrees to 24 degrees. It also adds additional underbody protection and chrome door sill protectors. The braked towing capacity ranges from 1800kg to 2500kg depending on the engine and gearbox. Volkswagen also offers its Trailer Assist system, which works with the optional Park Assist and rearview camera to make reversing and parking with a trailer easier.